Being uprooted during childhood may impact a person’s mental health well into adulthood, according to a new study. Researchers followed 1.5 million Danish children from the time they were 15 until they reached their early forties and found a higher rate of attempted suicides, substance abuse, mental illness, criminality, and violence among those who moved during their childhood. And the more frequent the moving, the greater the risk. Children who were relocated multiple times in the span of a year were more likely to experience these repercussions in adulthood than those who moved only once in a year. The age at which a child’s family had to move also contributed to the impact on his or her mental health in middle age, the researchers discovered. Middle school aged children were the most affected by a move. Those who moved at some point (or at several points) during these formative years were at the greatest risk of experiencing negative, move-related effects in adulthood. But with each birthday, the risk of negative impact seemed to grow higher. Kids who changed homes and schools multiple times in a year during early or mid-adolescence were at an even greater risk of violent offences, such as attempted suicide, substance misuse, or unnatural death. And the same risks held true whether families were affluent, poor, or somewhere in between. In other words, a family’s financial status did nothing to soften the blow of a move. Sometimes, moving is necessary. So what can parents do to help their kids cope with a move? 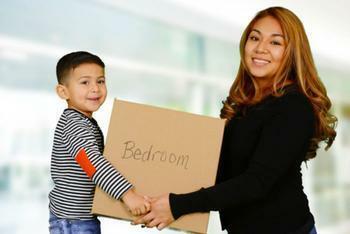 In addition to closely monitoring kids' psychological needs, the study’s authors say it may be beneficial to team up with officials in health and social services, schools, and other public agencies after a move. Prepare kids. Have your child tag along as you scope out the new house, neighborhood, school, and area. Help them stay connected to old friends. A goodbye party, where kids can swap contact information and make plans to keep in touch, can help keep a child’s social ties from being disrupted. Time it right. If possible, time a move in such a way as to allow your child to be there on the first day of a new school year or term. Keep things normal. When the initial chaos of moving and unpacking subsides, get back to how things were. Resuming familiar routines as quickly as possible can help kids see that not everything about their world has changed.